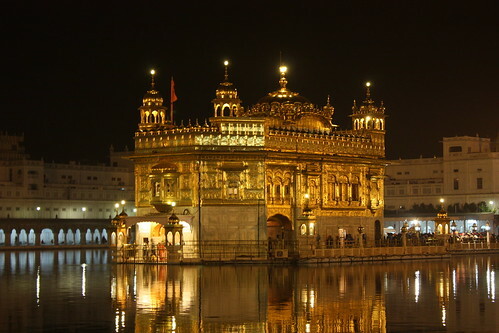 The Harmandir Sahib, informally referred to as the "Golden Temple", is the holiest Sikh gurdwara located in the city of Amritsar, Punjab, India. 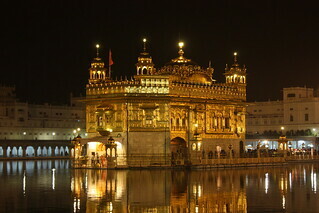 The city was founded in 1574 by the fourth Sikh guru, Guru Ram Das. The Harmandir Sahib was designed by the fifth guru, Guru Arjan, who had the cornerstone laid by the Muslim Sufi saint Sai Hazrat Mian Mir on 28 December 1588. Guru Arjan completed the Adi Granth, the holy scripture of Sikhism, in 1604 and installed it in the gurdwara. The present-day gurdwara was rebuilt in 1764 by Jassa Singh Ahluwalia with the help of other Sikh Misls. In the early nineteenth century, Maharaja Ranjit Singh secured the Punjab region from outside attack and covered the upper floors of the gurdwara with gold, which gives it its distinctive appearance and its English name. The Harimandir Sahib is considered holy by Sikhs. The holiest text of Sikhism, the Guru Granth Sahib, is present inside the gurdwara during daytime and the holy book goes for Sukhasan during the night time. Its construction was mainly intended to build a place of worship for men and women from all walks of life and all religions to come and worship God equally. Over 100,000 people visit the holy shrine daily for worship, and also partake in the free community kitchen and meal (langar) that is a hallmark of all Sikh Gurudwaras. The gurdwara is surrounded by the Sarovar, a large lake or holy tank, which consists of Amrit ("holy water" or "immortal nectar") and is fed by the Ravi River. There are four entrances to the gurdwara, signifying the importance of acceptance and openness. There are three holy trees (bers), each signifying a historical event or Sikh saint. Inside the gurdwara there are many memorial plaques that commemorate past Sikh historical events, saints and martyrs, including commemorative inscriptions of all the Sikh soldiers who died fighting in World War I and World War II. Much of the present decorative gilding and marblework dates from the early 19th century. All the gold and exquisite marble work were conducted under the patronage of Hukam Singh Chimni and Emperor Ranjit Singh, Maharaja of the Sikh Empire of the Punjab. The Darshani Deorhi Arch stands at the beginning of the causeway to the Harmandir Sahib; it is 62 metres high and 6 metres in width. The gold plating on the Harmandir Sahib was begun by Ranjit Singh and was finished in 1830. Maharaja Ranjit Singh was a major donor of wealth and materials for the shrine.